How’s a guy like me going to pass up a place called that? 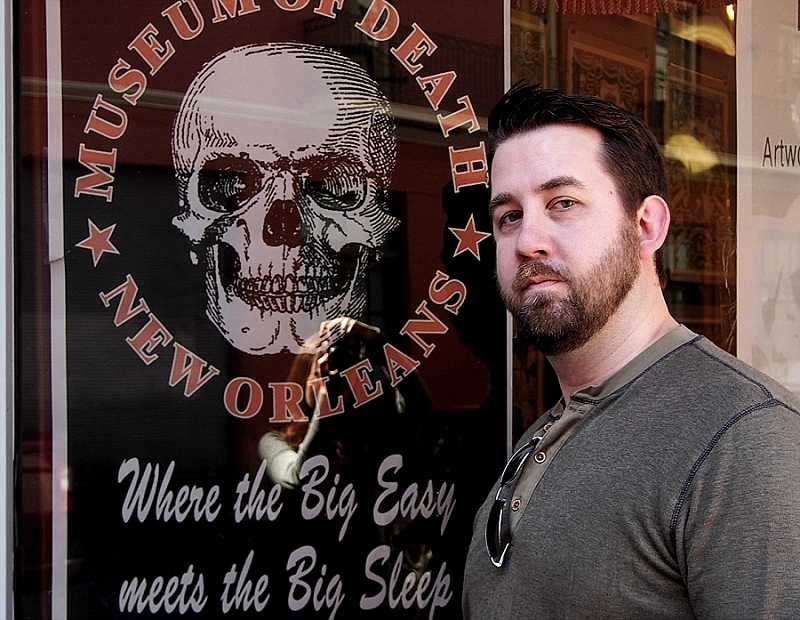 I knew a little about the Museum of Death. That it was a private collection. That it was a shocking collection. And that it was a collection that was supposed to be in Los Angeles, not New Orleans. Walking in, we found ourselves immediately in the gift shop. T-shirts, magnets, even baby onesies hung around us, all adorned with the skull that was the Museum of Death’s logo. A man stood behind a counter across from the door. I didn’t quite know how to play it. Should I act way into the subject? Pretend I had no clue what I was about to get into? I decided that my actor’s motivation would be “man buying hot dogs from a city street vendor.” Minimum of communication or eye contact. Thankfulness at whatever I was handed. He motioned us through a side curtain, which we entered, pocketing our cameras and phones since the museum didn’t allow photography. The large square room was laid out in a U-shape, with exhibits along three walls, and more on shelves on the interior of the U. It all seemed almost temporary. Like they’d never gotten around to customizing the space for the collection. At first, the exhibits were innocuous enough, some animal skulls and taxidermy, then it quickly turned to antique and modern funerary objects. Some Victorian death photography. A coffin. What stuck out the most to me here was the collection of funeral parlor matchbooks. 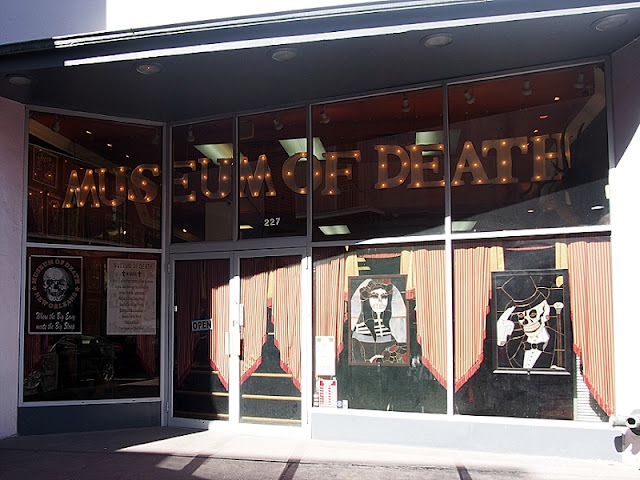 But after that, came the disturbing artifacts, the ones that the Museum of Death is known for: Its murderabilia. Unlike the Mutter Museum in Philly, which focuses on death and medicine or the late, great Morbid Anatomy Museum in New York, which focused on death and art, the Museum of Death focuses mostly on death and violence: serial killers, true crimes, mass murder, grisly accidents. It was started by husband and wife J. D. Healy and Catherine Shultz back in the 1990s in California. They had an interest in murderbilia, so they’d write to imprisoned serial killers, hoping for responses. They were also able to get the murderers to send artwork. Eventually, they had enough of a collection to stick the word “museum” above it. The various stated purposes of the museum are about what you’d expect: “To make people happy to be alive” and to “take away the stigma of dying.” There’s certainly something to be said for that, but it’s hard to pin those phrases above crime scene photos of the bodies of Nicole Brown Simpson and Ron Goldman, the kind of deaths that make you feel worse for being alive and should have a stigma. They also exhibit a strand of Nicole Brown Simpson’s hair. We viewed an assortment of Manson family photographs, an original Pogo the Clown painting by serial killer John Wayne Gacy—a piece that has become the symbol of murderbilia—a worn T-shirt from the band David Koresh was in before the Waco Siege, letters from the Unabomber and Jeffrey Dahmer. Just a complete record of man’s inhumanity to man, and the types of museum artifacts you gaze at with your palm over your open mouth in horror as opposed to your hand on your chin in contemplation. The most interesting piece in the whole museum to me was actually an item symbolic of the exact opposite: Man’s humanity to man. It was Jack Kevorkian’s homemade Thanatron, the series of tubes dangling from a metal frame of the euthanasia machine like the mini-gallows it kind of was. At the back of the room, a hallway led to a small theater. The walls were covered with old newspapers proclaiming tragic moments in history, and on the screen was playing what looked like footage of police and rescue workers cleaning up the messy aftermath of deadly car crashes. Eventually, it was time for us to leave. We walked past an exhibit on Elvis’ ignoble death and what was purported to be a real shrunken head before finding ourselves back in the gift shop. This time, I struck up a conversation with the man behind the counter. Turned out it was Healy’s brother Scott, and this New Orleans annex of the original Los Angeles Museum of Death had opened June 1, 2015, only about eight months before our visit. As a guy with an obsession fir the macabre, I’m fascinated by people who can go further with that interest. “Oh, really, you like quaint new England graveyards and the incorruptible bones of saints? Well, here’s an original crime photo of Sharon Tate’s bloody, pregnant body at the Manson compound.” It always feels to me like it’s kind of a rebuke. A completely legitimate one. We hear it a lot these days. Death is natural, and we need to get better at death as a culture. We need a more intimate relationship with it. We push it too far away, locking it up in expensive boxes full of embalming fluid that are carted around by strangers in suits. I say similar things myself, framing cemeteries as places people should hang out at and enjoy. But death isn’t always natural. Violent, senseless death is a dark mirror that disfigures our comfortable philosophies of life. But the one unassailable fact of the matter is that the stuff in the Museum of Death is history. And the present. And the future. Murder happens, so it must be reckoned with. As we left, a couple were standing outside, uncertain whether to enter. “Is it worth it?” one of them asked me. Odd Things I've Seen: The Podcast. Available on all major platforms. 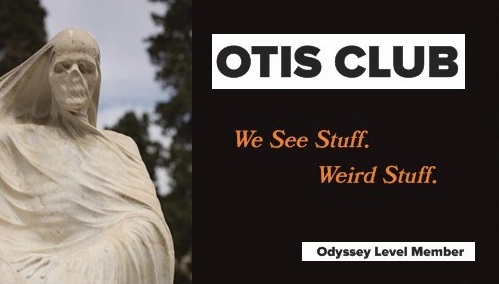 JOIN THE OTIS CLUB ON PATREON! GET GREAT PERKS! Want Me to Sign Your Book? Email me at ockerjw@gmail.com to let me know it's coming. Some OTIS Club member levels can skip return postage. All content copyright J.W. Ocker. But just ask me. I'll let you use just about anything here. Powered by Blogger.